Each user has their own individual work schedule. This is where their standard hours of work, vacation, PTO, leave of absence, other non-working time or non-standard work hours are set up (such as the user working a half day instead of a full day on one specific day only) is set up. This user work schedule can then be used to schedule tasks. A user work schedule will inherit the settings from a default work schedule. It can then be edited for that specific user. Each time a resource is assigned to a project, there is a setting for that resource that controls which work schedule to use. See Add Resources to Projects. If it is set to use the users work schedule for scheduling then if a user has vacation time set (or any other non working time) and a task is scheduled to occur within the same time frame, the duration of the task will be extended to accommodate the number of vacation days. For example, a task has a 5 day duration and it starts on Monday and ends on Friday. If the users has two days of holiday booked, say the Thursday and Friday, then the task duration will be automatically extended by 2 days and will end on the Tuesday of the following week instead. Each users work schedule will be based on a Default Work Schedule(s). 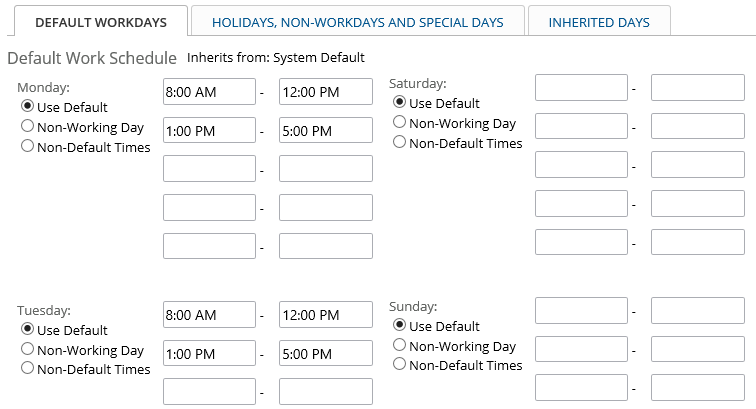 Default Work Schedules can be set up by your system administrator to track all the organization wide holidays, shutdown times, other non-working times and non-standard work hours. When you add a user, you specify which default work schedule theirs will inherit from. The information from that default work schedule is pulled automatically into the users Work schedule so it doesn't have to be re-entered each time for each individual user. User specific information can then be added. In the work schedule add/edit form for a user, the default work calendar applied to them will be displayed at the top of the Default Workdays tab. The information will be populated with the data from the default work schedule but then can be changed. Note* the users vacation, PTO, leave of absence, any other non-working time or non-standard working time over-ride any settings in the default work schedules if there is a conflict. For example, the default work schedule has a company wide holiday set for December 25th. The users work schedule can be edited and December 25th set as a work day for that specific user. That would over-ride the holiday setting in the default work schedule and schedule the user to work that day. System Administrators and User Managers can always edit a Users Work Schedule. There are also additional settings that can be turned on to allow the user to edit their own work schedule or to allow the user's default time sheet approver to edit that user's work schedule. See User Settings. A System Administrator or User Manager can edit a Users Work Schedule via the Users in the Administrator section or by clicking on a users name anywhere in the system. That will open the Users Display form. Click on the Work Calendar Edit icon on the User Name Title bar. A default time sheet approver can edit a Users Work Schedule, by clicking on the clicking on a users name anywhere in the system (such as from the User Directory). That will open the Users Display form. Click on the Work Calendar Edit icon on the User Name Title bar. A user can edit their own work schedule the same way or by hovering on their name in the main menu bar and clicking the Edit Work Schedule menu option. The work schedule add/edit form will appear. A third tab may show depending if there are holidays, shutdowns, non-working days or non-default times entered in the default work schedule associated with this users work schedule. This is where you set the default hours of work for each week for this specific user. It will be initially populated with the details from the default work schedule. It may be left as the those defaults or changed as required. First, there is space for each day to enter up to 5 different stop and start times throughout the day. For the majority of organizations, having 2 stop and start times is most common, i.e. the time you work before lunch and then the time you work after. The example below illustrates this. It indicates that work starts at 8 am and goes for 4 hours until 12 pm. Then there is 1 hour of non-working time (lunch), then work starts again at 1 pm and goes to 5 pm for another 4 hours of work. 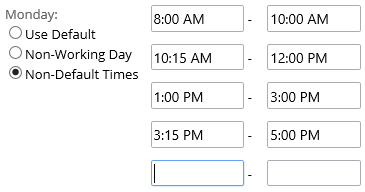 The remaining three start and stop times are just left blank because they aren't applicable. As indicated, for the majority of most organizations - 2 start and stop times for a day provides detailed enough scheduling, however, you may change the hours indicated to reflect their company. For example, a company generally works a 7.5 hour day instead of an 8 hour day and they just take 1/2 hour for lunch. So instead of starting at 8 am, they start at 8:30 am and the afternoon work time starts at 12:30 until 4:30. If you did have requirements for tighter time controls, then you can enter those. For example, it is an 8 hour work day with 1 hour lunch but there are also 2 - 15 minute coffee breaks included in that 8 hours. So really, the team is productive or doing work only 7.5 hours. In this case, you would have 4 start and stop times entered. or scheduling and the times are displayed and visible to anyone looking at the task so they do have to make sense for your organization. The reason that the start and stop times are important is that they are used for scheduling and the times are displayed and visible to anyone looking at the task so they do have to make sense for your organization. For example, if you worked an 8 hour day, you could just put in one start and stop entry for 8 hours, such as 8 am to 4 pm. Tasks would be scheduled to end at 4 pm and that time would show on tasks. Your scheduling would be correct in terms of hours because Project Insight knows its an 8 hours work day, but stakeholders might get confused seeing end times of 4 pm when staff really do work until 4:30 or 5 pm. So it is recommended that you enter in accommodations for lunch breaks (as outlined above), to get as close to possible as staff are actually working and not just enter in a continuous day with no start and stop times. 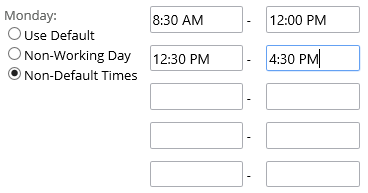 For each day of the week, there are radio buttons which indicate if the times for that day are Using the Default times, it is a non-working day or it is a working day but it is not using the default start and stop times. These radio buttons have different meanings depending on which work schedule you are editing. These radio buttons will be set automatically by the system depending on what you enter, but you can also set them manually. System wide default work schedules - In the back-end functionality of Project Insight that you don't see, there are default start and stop times set for each day of the week. Monday to Friday has an 8 am to 12 pm start and stop time and a 1 pm to 5 pm start and stop time (for an 8 hour work day). Then there is no work start and stop times for Saturday and Sunday as those days aren't usually work days for a large majority of companies. 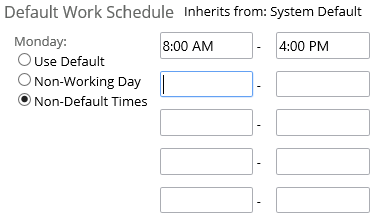 When you are editing default work schedules, and the radio button is set to Use Default it means to use those back-end default start and stop times (and those are what are displayed). If you change the start and stop times to something other than that, then by default that day will be categorized as a non-default time setting. If you remove the start and stop times entirely for the day, then it will be categorized as a non-working day. You don't necessarily need to be concerned about these settings. For you, they are informational only however Project Insight does use those settings in the back-end though to calculate task schedules quicker and easier. Individual user specific work schedules - For each user, you set the default work schedule that their individual schedule gets data from, then you can change it. The Use Default radio button indicates that it is using the default work schedule for that day from the default work schedule. If you change the start and stop times to something other than that, then by default that day will be categorized as a non-default time setting. If you remove the start and stop times entirely for the day, then it will be categorized as a non-working day. Again, this is informational only for you. Project specific work schedules - For the project calendars, it is the same as the Users. For each project, you set the work schedule that the project work schedule inherits data from. If you leave that, it is set as Use Default. If you change it, then it switches to either the non-working day or non-default times setting. This is where the user specific vacation days, PTO, Leave of Absence or any other non-working days or non-standard work days are entered. This needs to be maintained on a yearly basis. In the first date entry field, enter the start date of the non-working time, holiday, shutdown or non-default working times. Type in the date (a hint will appear with the date format and some shortcut keys for entering dates when you click in the field) or click the Calendar icon to select it. The To Date will be automatically populated with the same date when you tab or move out of the first date entry field. If you are entering only one day, then just leave it the same. If you are entering multiple consecutive days of holiday, non-working time etc. then enter the To date. Type in the date or click the Calendar icon to select it. 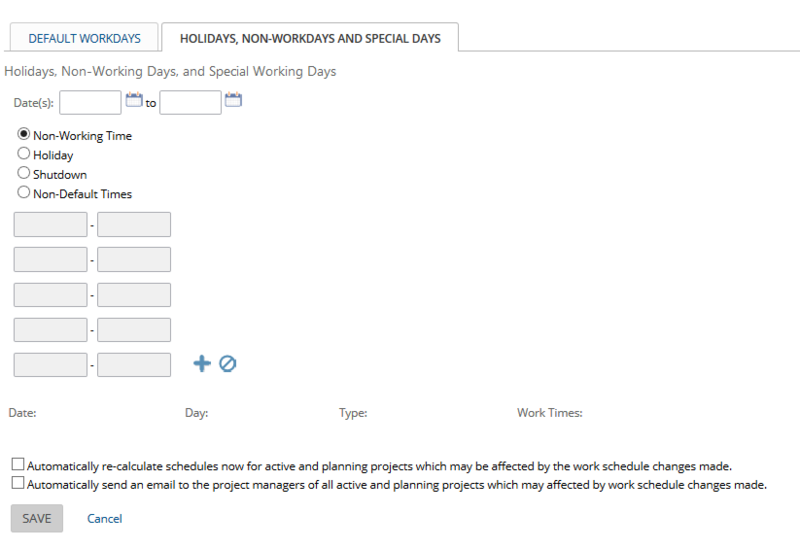 If it is a non-working day, categorize it by clicking on the available options. If you are entering the Default Work Schedule(s) or a Project Work Schedule, the options are Non-Working Time, Holiday or Shutdown. If you are entering a User Work Schedule, the options are Non-Working Time, Vacation, PTO, Leave of Absence). See the section below for how the categories are used. Click on the appropriate option. 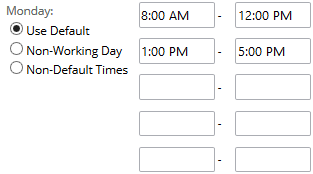 If it is a working day, but the times for that day are different than the defaults you set up on the Default Work Days tab, click on the Non-Default Times category. The spaces for entering the stop and start times for the day become available. Enter in the special working times for that day. For example, if it is a half day instead of a full day, enter 8 am to start and 12 pm to end. Click the Add icon (the blue + sign) to store this entry. It will be listed in the section below the data entry boxes. NOTE* This is not yet saved in the database. This is just creating a working list of holidays. Do not move off this form until you actually it. Continue adding any other holidays, vacation or other non-working days and special days as required. When you are done adding vacation days etc. click to save the changes. Display of Holidays, Shutdown, Vacation, PTO, etc. 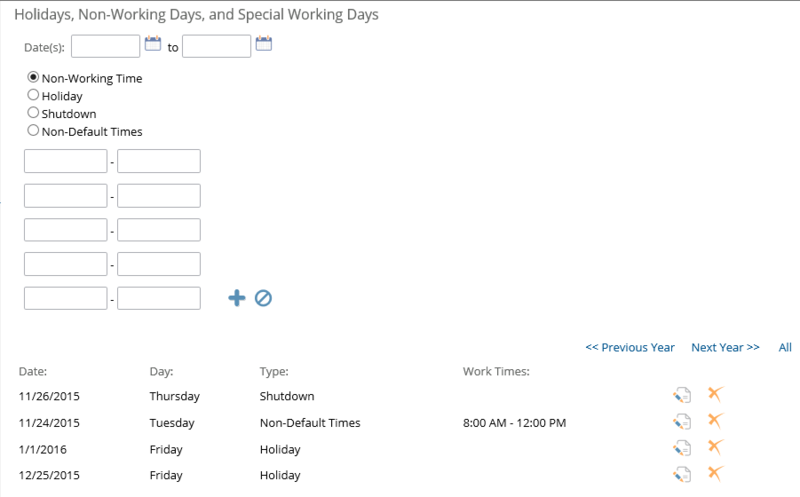 Once holidays, shutdown days, vacation, PTO, or any other non-working or non-standard working days are entered and saved, the current year ones will show by default on the same form. If this is a project or user work schedule, then only the holidays, vacation, etc. that is set specifically for that user or project appear on the Holidays, Non-work Days and Special Days tab. To see the holidays, set up in the default calendar associated with this user, click on the Inherited Days tab. Navgiate through this display the same way by clicking on Previous Year, Next Year or All text. If you change a Users Work Schedule and there are already active or planning projects and tasks using that users work schedule the changes will be applied in different ways, depending on who changed the schedule and some other settings. If a System Administrator, User Manager or default time sheet approver changes the User Work Schedule, they have the option to re-calculate schedules immediately for active and planning projects which may be affected by the work schedule changes made. They can also optionally email project managers of any updates to their projects. These options are found on the Holidays, Non-Working Days, and Special Working Days tab. A task is edited - the change will then be applied. A task is updated by another function - such as Updating Rates (from the Resources menu option) or forcing immediate planned and earned value calculations from the Project Status tabs Budget and Performance. Project Settings to Capture Active Project History Nightly has been set with a time. The project schedule will be updated automatically when that function runs at that designated time. If you do allow users to edit their own work schedule or you allow default time sheet approvers to edit work schedules, you may want to set up Notification Settings to inform the project manager of any scheduled task start and end date changes that they didn't initiate. The dates that the task is scheduled to start and end will be determined by the using the System Default Work Schedule. The users individual work schedules can't be used to determine duration in this situation because they are different and conflicting with one another. Once the Duration is calculated from the System Default Work Schedule then each Users individual work schedule is reviewed what days they are available to work during that duration and distributes the number of work hours they are assigned evenly over those available days. This can result in a resource being over-booked on those days. For example, a task is scheduled to take 5 days duration. Two resources are assigned to it with 40 hours of work each. Since there are two resources, the system uses the System Default Work Schedule to schedule the task; which is that it will start on Monday and end on Friday. One resource assigned to it, has a vacation day booked on the Friday of that week (so they are only available to work 4 of the 5 days the task is scheduled for). The first resource (with no vacation) will have 8 hours scheduled each day for 5 days (Monday to Friday). The second resource with the holiday, will have 10 hours scheduled for each day for 4 days (Monday to Friday). Tip - if you have this situation occurring and you want the task duration scheduled according to each individual users calendar, then create separate tasks for each resource (assigning just one resource to each task). You may also group the two tasks under a summary task in order to manage their completion together.